Remington Estate Sales LLC desires that your estate sale be a fulfilling and successful venture for you and your family. The Remington partners have prepared the following guidelines to assist you in this endeavor. The Remington Estate Sales team is committed to maintaining integrity when conducting your estate sale. Whether you are downsizing or making a life changing move, making arrangements for a dearly departed family member or helping a parent into new living arrangements, we are there to make this often difficult and trying time manageable. Our experienced team will work tirelessly to sell your estate. Our estate sale professionals in Dallas will provide you with answers to most any questions you might have about your estate sale. Based on our past experiences, and our years of hands-on work in estate services, we are comfortable with any situation. References are available upon request. As one of the premiere estate sale companies in Dallas, Texas we take great pride in staging the items in your home to maximize the shopping experience for our customers. This in turn will maximize your financial outcome. Our Team will research, determine and set the selling price of all items based on current fair market value by using discretion on sale price trends. Of course we take Master Card, Visa, Discover and cash. When you sell your estate in Dallas with the Remington Team will arrange for appropriate advertising. Your sale will be listed on Estate Sale Networks, emailed to our buyer contacts, Social Media sites and if appropriate, we will place ads in area specific local newspapers. In addition, we will place professional sale signs in the yard during the sale and additional signs in the vicinity of the sale if permitted. 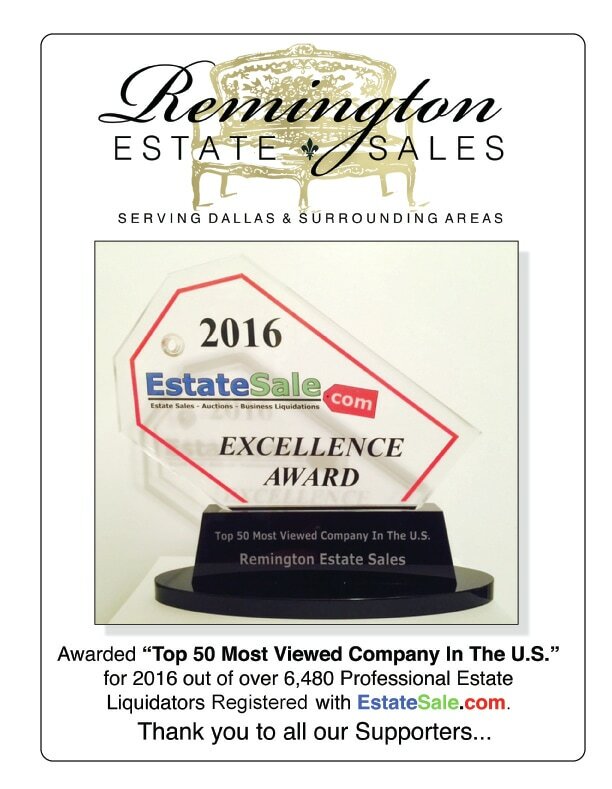 Another service Remington Estate Sales provides for our clients, which other estate sale companies in DFW may not is we collect Texas Sales Tax on all sales, except for tax-exempt buyers. This we file and pay to the state, one less worry for you. • Each sale is customized to the client’s individual needs and requirements. • DO NOT throw anything away! Take what you want from your home and leave the rest while keeping in mind the more you have in your sale the greater your proceeds. The only thing we don't sell is trash. Please let us determine trash from treasure. • We will provide all tables, pricing supplies, bags and wrapping paper. • Remember… We will provide all signage and all advertising. • Many of our clients do not attend the set up or the sale because it is a stressful event. Considering this we will communicate with you daily on the status of your sale. • At the conclusion of your sale what has not been sold we will provide you with many options for removal of such items. • Your home will be left broom clean. • You will be given a statement of accounts and a check less our fee that you can cash immediately. Please contact us for further details about our estate sale services. "a wonderful and profitable experience!" The Remington Team was a pleasure to work with from beginning to end. I could not be more pleased with the result. They were incredibly easy to work with and very professional. The sale was a huge success thanks to their excellent advertising and network of buyers. I highly recommend!! We are astonished at what Jose and Stephen did for our estate sale. They are extremely professional and great guys, too! Their team took great care of our home and our sale was a big success. They know their business and you won't go wrong working with them. Everything looked great, was organized well, priced fairly and there was lots of communication along the way. Almost wish I had more to sell with them. Experts in art history and architecture, this hardworking, reliable company delivers years of experience in design and collecting. Your home will be treated as a whole, with your items thoroughly researched, beautifully staged and skillfully publicized. The Remington Team members are great communicators and make the process fun through warmth and humor. They have a large collector base and reach out regularly with current announcements to their followers. They convey their business procedures clearly to the client and they run their sales with attention to detail and safety. Their genius is their deep understanding of family dynamics and the personal significance of the objects they represent. By finding the personal stories and merging them with historical facts, the Remington Team makes the sale meaningful and accessible to the client. It is a secure process of discovery for the family resulting in a satisfying closure. You are sure to be pleased with the Remington Team’s thoughtful approach to your family’s tangible and intangible valuables and the comprehensive finish they bring to this important chapter of life. To say that my wife and I were ecstatic with the results is a gross understatement! We have struggled to find words and decided to simply say.."If you are going to have an estate sale for any imaginable reason, CALL REMINGTON as fast as you can!" Jose, Stephen and Georgette are an extraordinary team that conducts themselves in a most courteous and professional way we've ever seen, And, the team of assistants they bring with them is the same. The respect they show for your home, and your items is exactly what should happen..wherever they learned all this, they surely were great students. From the opening bell to the early closing because they sold out was nothing short of WOW! Even with a closed sign clearly visible the door kept knocking with people trying to get in. It is no wonder that they have built a tremendous following week after week. Once again, if you need any service of this kind..CALL REMINGTON ESTATE SALES. When my grandmother passed away, our family knew that we would have to help my grandfather down size from their home of 50+ years and sell many of their belongings from a 63-year marriage. With her death, the move, and sorting through so many precious things, it was a really emotional time for all of us. We knew we could not handle it on our own. From beginning to end, the Remington Estate Sales team was unbelievable. Their integrity and professionalism was beyond what we could have asked, and the way they were sensitive to and honored my grandfather's wishes in the process was second to none. No question was too small or silly, and most of them they had thought of before we even asked. When we came over to the house before the sale, we could not believe how beautifully everything was staged. In many ways it brought the house back to life again, even if just for a few days. Grandmother would have been so proud. We could tell that they love what they do and they genuinely care about helping families transition through a difficult season. If you are looking for someone to help your family facilitate an estate sale, I would recommend Remington Estate Sales without reservation. R.E.S. We would like to thank you for the wonderful Estate Sale of my mothers house in Lake Highlands / N.E. Dallas. I chose you guys from a pool of 4 that we interviewed. You had a quality about you of both care and success. You even exceeded your own expectations. Please feel free to use me as a personal reference. I am late in writing to you because I wasn't ready to accept that you were gone. I could write "thank you" a million times and it wouldn't be enough for all you did to make my estate sale so successful. I know now that I was unbelievably lucky to have found you and will never forget this experience or you as individuals. You were kind, caring, respectful and respected, thorough, knowledgeable, fair and creative---and so much more. I don't think I have ever "fallen in love" with strangers until I met you. My life is so much fuller having worked with you. As you know, I offered to adopt you or have you adopt me if you ever need another Grandmother! I was serious. Special people don't come along very often in life and I am so grateful that I met you. With thanks to true professionals and friends. What you did was miraculous and brought tears to my eyes. Mother would be so thrilled to have her possessions displayed so proudly and with such style. I love you guys for all your hard work that has brought honor and respect to my mom. I thank God for placing you in my life just at the right time. I spent time reflecting our family life and Mother's life and it was healing and special. You made it possible for me to find peace in the midst of the turmoil. Know that you three will always hold a special place in my heart. "With an emphasis on integrity and quality of service that clients call “miraculous“, Remington Estate Sales stands out from the crowd in the best of ways. They take every estate sale seriously and it shows. They know all the ins and outs of staging objects to maximize your profit and give customers the best experience possible. Check out their testimonials to see why we think Remington is most definitely one to watch!" 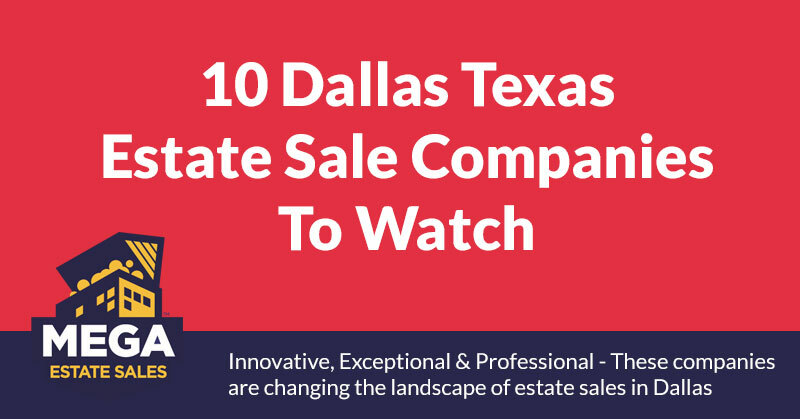 Commentary from Mega Estate Sales, we are proud to be featured as one of the 10 Dallas Estate Sale companies to watch!